No, I'm not talking about not some amazing new J-game involving cards and balls (though that actually sounds like it could be awesome). See, there's a Japanese word that has confounded me since I learned it years ago, and that is 「ダンボール」. "Cardboard," in English. Usually when you come across a katakana word drawn from English, you can tell fairly quickly what the base word is or at least guess what it's getting at. Even with 和製英語. With this one, I really had no idea. So, I finally decided to Google it. The 「ダン」, as it turns out, is 「段」, which can mean tier(ed). 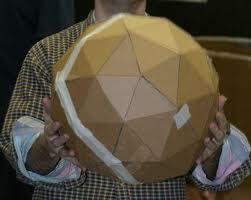 This is most likely because cardboard is corrugated, and if you were to look at a cross-section, you would see two or more little layers kind of connected by ridges. Fair enough. As for the 「ボール」part, which looks like "ball," I came across one explanation offered at Yahoo Answers-type websites, and one that Wikipedia kind of hinted at that I am going to proffer. 1) Whoever coined the Japanese word for "cardboard" misheard or had trouble pronouncing "board" and said 「ボール」(ball) instead. It caught on and spread, and voila. This was an answer I came across multiple times across the webiverse. 2) 「ボール」is actually short for 「ボールド」. I think this is plausible since so many words in Japanese can be and often are shortened. Wikipedia didn't explicity say this, but it did say the origin of 「段ボール」's 「ボール」 is the English word "board." So there you have it. Man, now I wish "cardball" were an actual Japanese game. 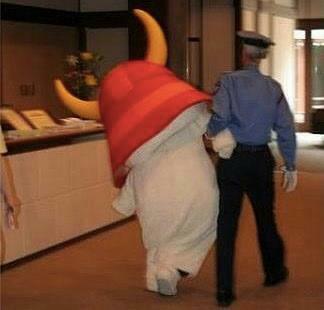 (Source) If you drop it, you get smacked in the crotch. As always, send your answers to blueshoe[at]jadij.com. Happy riddling! There aren't a lot of smells that I clearly/fondly remember, but there is one that I miss from Japan. That is the aroma of the 金木犀 tree; in English, sweet olive. 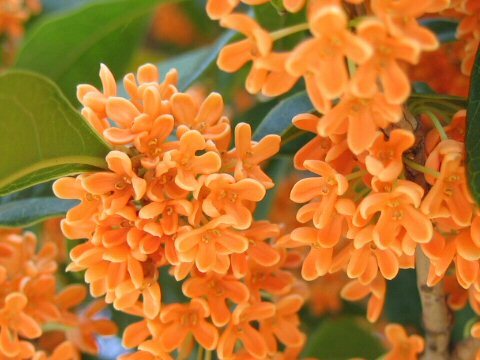 I don't recall seeing or smelling them in Tokyo, but in Hyogo every autumn the orange flower clusters would blossom release their fragrance. Unknowingly I came to associate this fragrance with "fall." I remember asking one of the JTEs (Japanese Teachers of English) that I worked with about the trees and what they were called, and he told me they were「きんもくせい」. He then wrote some characters on the blackboard behind us as told me that these were its kanji: 「金目生」. When I looked it up later, turned out he was wrong. Strange! Lately I've been thinking about buying one, if I can find the right variety. There are different kinds of sweet olive, and the ones in Japan are aurantiacus. According to my research, a lot of the sweet olive trees from China bloom year-round but aren't as fragrant as the kind that only does so seasonally. I've found a few vendors online that carry them, but they appear to be the white-flowered, original Chinese version. Hoping I can find the J-variety. Update: Found it (Nurseries Carolininia)! Update: Bought a Japanese one and a Chinese one, so I can compare. Also it seems the Japanese variety won't bloom until it grows to about 4', which could take a while, whereas the Chinese kind blossoms from around 6". Update 10/22/2014: Has it really been two years since I bought these things? Unfortunately they don't seem to have grown very much, probably due to last year's severe winter. The late cold snaps couldn't have helped much. I don't think I'll be smelling that sweet fragrance for a while yet, but I still hunger for it! Remembering those early, mild Japanese autumns really takes me back. Fond memories, indeed. Some mornings I can practically smell the blossoms... Is there such a thing as a phantom smell, I wonder? Last year the Japanese one wasn't look too hot. He had to be trimmed a little bit, so now he's a little shorter. Still, that's some nice leafage coming in now. The Chinese variety seems a little more vigorous. The Chinese guy is doing well, too - even better than the Japanese one. I think that's because the Chinese one is closer to the house and thus less exposed to the cold wind in the winter. Hopefully not too many more years before these things start to bloom! This post is part of the 2014's J-Bloggers' Carnival #3 (link live after 11/1), hosted by Sophelia. Be sure to check out the other entries! Another Japenglish word I remember coming across now and then is 「リフォーム」. 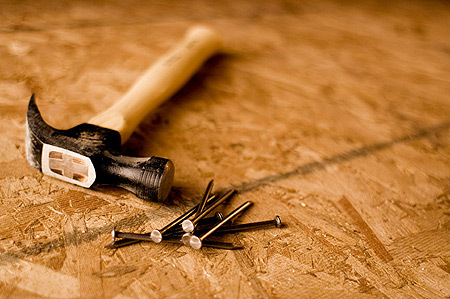 Although from the English "reform," it actually means "renovation" or "remodeling." Often usually there seems to be some reason why the Japanese adopted these slightly off adaptations of English words (sometimes due to an old usage or a discrepancy between American and British English). So it's possible that in the U.K. people don't renovate their homes but actually "reform" them, I don't know. In American English, however, "reform" is most often used in the context of changing something bad about a person or an intangible (like a way of governing). You often hear about reforming healthcare laws or immigration policy. These days I kind of feel like I am just drifting. It's not that I'm not trying; I've been job searching and applying, networking, trying to maintain my Japanese, meeting people gradually. But right now it feels as if there's really nothing more I can do but wait for something to happen. Keep trying until something is successful. I know I have a lot to be grateful for, but I'm just getting sick of feeling like I have no control over what's going on and where my life is going. I went to a private elementary school, and from there I choose to go to a private high school on Long Island, arguably with the best academic reputation in the state. I got in. While in high school, I decided which college I wanted to attend. It was the only school I applied to; I got in early and went. In college I chose to double major. I chose to study abroad in Japan, twice. I successfully worked my way through all that. When I was finishing up school, I applied to the JET Program and was accepted. And I guess that's about where I lost my way. I've returned to the States and am kind of lost. I could probably be happy in a number of different fields, but the environment has gotten so competitive. I think what I'd really like is to go into public policy or international affairs, but without a graduate degree of some kind or related experience? I am just hanging here in the wind. Recently I've been looking at a lot of different things. Military (reserves, at least)? Moving back to Japan? 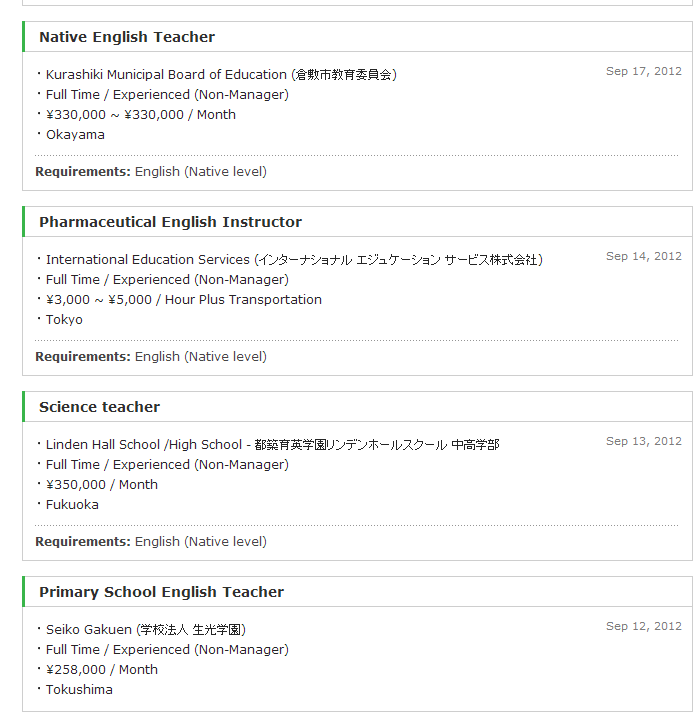 Out of curiosity I did a quick job search earlier, and there are plenty of English teaching jobs. Would it really be so bad, I wonder? Go back, teach English for another 10 or 20 years. Get married over there and have kids, maybe. I can imagine worse lives. But nothing is a sure thing in life. I could also go over there and spend 10 years teaching English, only to find that I am no longer qualified to move into any other field. I wish I had the clear direction in my life that I used to have, the feeling that I have a wide variety of options. Right now everything just feels so...limited. Even if I were to move back to Japan, I don't know if I could regain what I feel like I've lost. A friend's photo from Facebook. The shame! 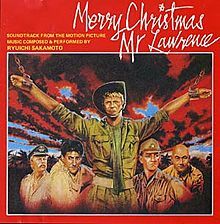 You know, it occurs to me that I haven't done a post yet on what has become my favorite J-movie (along with my favorite soundtrack). Well, you may recall a post about Kintama Girls, from the movie Detroit Metal City, so I guess I've touched upon it. Sometime soon I'll write something a bit fuller on DMC, but I wanted to quickly post a sample of the "other side" of the movie's soundtrack - 甘い恋人 (Sweet Love). This is the kind of music DMC's protagonist longs to play, despite becoming embroiled in metal.